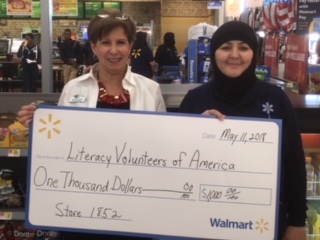 Literacy Volunteers of America – Prince William., Inc (LVA-PW) was recently awarded a $1,000.00 grant from each of three local Walmart Stores; Woodbridge #1852; Sam’s Club #6371 and North Stafford #2438. Thanks to the generous grant support from these local partners, the LVA-PW ESL and Job Readiness Program for New Immigrants can offer English language and job readiness skills to new immigrants with families in our community to help them become self-sufficient. Approximately 10% of all LVA-PW adults work at, or started their first job in America, at local Walmart stores. Literacy Volunteers of America – Prince William., Inc. (LVA-PW) is an award-winning community-based adult literacy organization whose mission is to teach adults the life-changing skills of reading, writing, and speaking English which will enable them to prosper in our society. LVA-PW is the largest adult literacy non-profit in Prince William County offering year-round enrollment to meet the literacy needs of low-income adults. LVA-PW has served the community for over 27 years and offers classroom and one-on-one tutoring in basic reading and writing, English as a Second Language (ESL), GED preparation, civics and citizenship, computer and financial literacy, job readiness levels from beginning to advanced and an innovative Confidence Course. These grants are just one example of Walmart’s commitment to “giving people access to a better life; one community at a time.” A young mother of three from Afghanistan, who learned English through LVA-PW classes and who now works full-time at Walmart, says “I am so grateful to LVA-PW, thanks to you, I now have a job that I love and I can take care of my family.” Thanks to community partners, like our local Woodbridge partners, LVA-PW is able to serve over 700 adults, across Prince William County, with the help of over 220 trained volunteer tutors each year. For more information about LVA-PW and to learn how you can help, please visit www.lvapw.org or contact them directly at 703-670-5702. Thank You Sandy Springs Bank Employees!